The Company, RHONDA OCHS LLC has its heritage rooted in the aesthetics of its founder and designer, Ms. Rhonda Denise Ochs. Gleaned from seven years as a fashion model in Europe, Rhonda soon melded her appreciation for vintage clothing with modern Bohemian touches. In the mid 2000’s, Rhonda set course on establishing her own company, with showrooms in Los Angeles and New York. The RHONDA OCHS brand sources the finest exotic skins of alligator, crocodile, snake and lizard, Italian luxe leathers and accoutrements gathered worldwide, as the underpinning of her burgeoning collection. The alligator and crocodile skins are selected through a rigorous process: either these are wild alligator taken in various lawful producing territories or farm raised using fully sustainable and approved methods. Then, the Company seeks out the most skilled “white glove” factory artisans throughout Mexico and Southern California which maintain best labor practices to handcraft her products. Rhonda imbues the products with all of her incredible attention to detail including real-time quality control inspection of: selection, dying, washing, and cutting skins, pattern making, hand stitching and braiding processes. Rhonda often travels to her factories to personally inspect and critique the smallest detail of the hand made goods during the process. While in such mystical locales such as San Miguel De Allende, Mexico, Rhonda gains spiritual and creative inspiration.
" 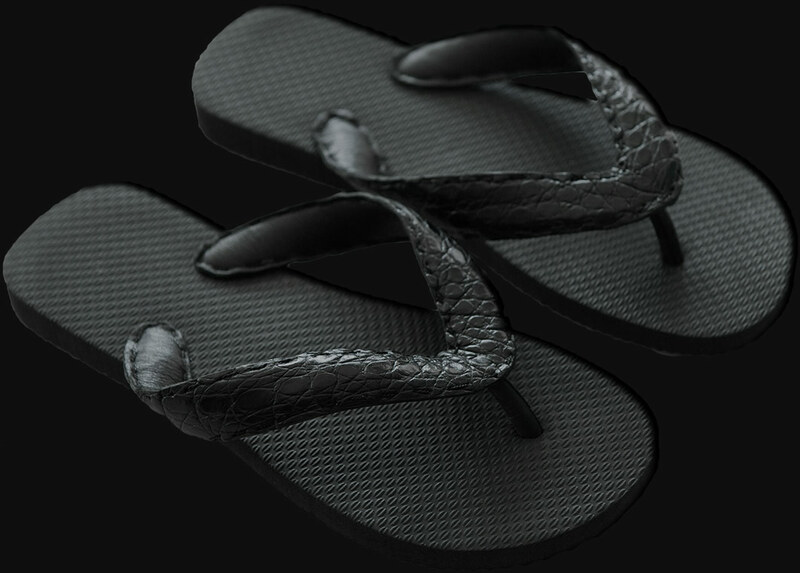 The pioneer of the gator flip-flop craze! " The RHONDA OCHS product lines are constantly embellished with new offerings. In 2012, RHONDA OCHS pioneered the gator flip-flop craze, which is still a major fashion hit. In 2014 she expanded a casual exotic skin shoe line including boots ballerina flats, “mules”, “kicks”, and “slides”. Reflecting her broadening ethos, her fashion adorned exotic skin jewelry has been a recent smash. 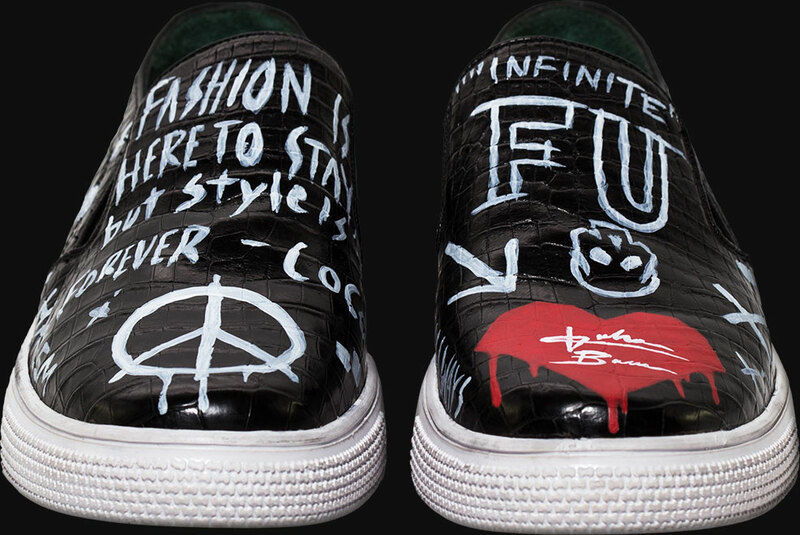 Currently, Rhonda has been collaborating with famed graffiti artist John Born in featuring hand painted handbags, shoes, and accessories. In 2016, ROCHS brand will emerge, as Rhonda plans to re-interpret some of her own exotic skin designs using Italian leathers and other fascinating materials. There is no stopping RHONDA OCHS! "Available only at the finest stores"
RHONDA OCHS handbags, shoes and accessories are sold domestically at only at the finest stores, including Maxfield’s, Elu, Stacy Todd Boutiques, Elysee Walker, Juicy Lucy, Savannah, At Ease and Madison among others and internationally at renown hotel shops, boutiques and stores.